The complete blue print for athletes and coaches that want to develop a foundation for a completely new way of training. In this course Dr. Hendricks will teach the 4 pillars of upper body strength training and how this concept should be introduced to athletes of any age or skill level. From bent-arm and straight-arm strength progressions, to hand balancing and weighted stretching, to break into new movement patterns. This course will leave you with actionable systems to immediately implement with you and your athletes. The proper progressions to go safely and effectively from no push-ups and pull-ups to strict muscle-ups. And the most common question, where to go from there? What this is and why it’s the most powerful tool you aren’t using for scapula strength. Scapula strength has a direct correlation to breaking through your weak links as well as addressing shoulder issues. This is the real secret to bulletproof shoulders. Learn the proper exercise progressions that address body alignment and rebalancing coordination for optimal muscle activation. When these progressions are skipped, progress can stall. The science behind actually developing efficient and safe ranges of motion. Addressing joint mobility, prehab/rehab and developing resilient wrists, elbows and shoulders. 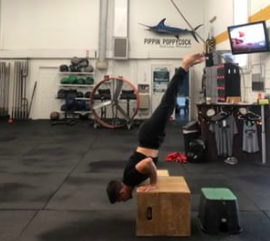 8-9: Handstands - Learn the foundations of handstands: core stability, shoulder strength, bulletproofing your wrists and most importantly how to train these safely without injuring yourself. 9-10: Weighted Stretching - You been foam rolling, stretching and using bands for years. Time to upgrade your mobility work...Learn HOW! 10-11: Bent-Arm Strength - Finally get pull-ups, ring dips or muscle-ups! Learn the proper muscle activation patterning, progressions and accessory exercises to safely achieve these. Get our FREE resources, guides, tips and tools on how to improve your movement and more!